My favorite project from our Baptismal Party was my Garden Flag. The best part about it is that it is versatile for any season or event. All you need is an image that you can make a mirror image of and you’re good to go. Thanks to Dimple Prints I had just that! Your materials are minimal. Remember, I don’t know how to sew so this is a NO SEW project. You’ll need fabric glue, muslin fabric (I bought a yard because I knew I’d use it for other projects), heat transfer sheets, and an image that you can manipulate in Picmonkey or another program to be a mirror image. 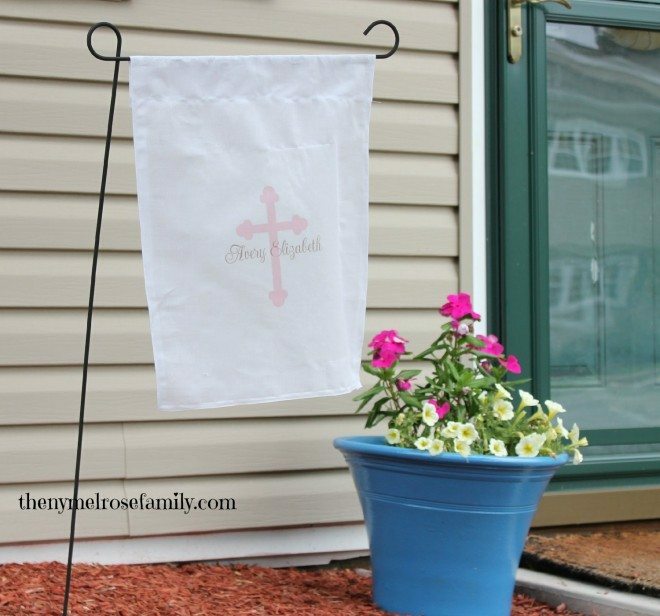 You’ll need to cut the fabric to the size that works for your garden flag. I used another flag as my template and left two inches on each side for a straight hem that I glued down using fabric glue. At the top I left six inches so that the pole could seamlessly slip through the fabric. For the image you’ll want to follow the directions on the heat transfer sheet, but you’ll absolutely need a mirror image of your design. Let the glue on the flag dry for twenty four hours and then you’re ready to hang it. The muslin fabric worked extremely well because the glue dried quickly and the image showed up beautifully. 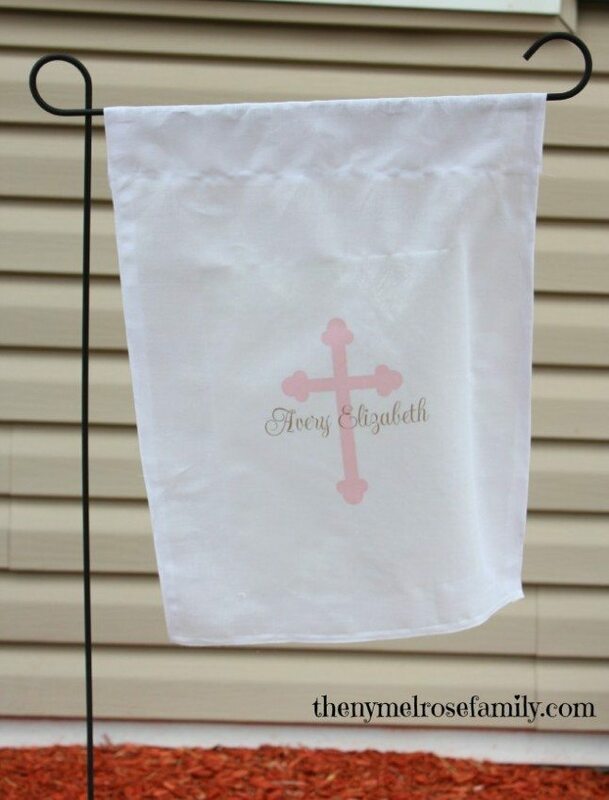 Plus, it rained on the day of Avery’s Baptism, but the garden flag looks exactly the way it did the day I did the heat transfer. LOVE! Such a great idea for a baptism celebration. Or any celebration for that matter!